2 TV points with external aerial plus antenna hook up. A superb camper. blinds & fly nets. Remote central locking. New battery. 240v plug sockets. Plenty of 12v points throughout. Windscreen & front door window black out covers. 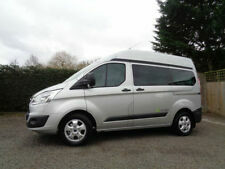 Vehicle drives lovely for age and is in immaculate condition a few minor marks due to age. It is MOT'd until October2019. two sets of keys. it has a solar panel, TV aerial on the roof, a bike Rail, a ladder, awning, speakers in the back, a portable toilet. 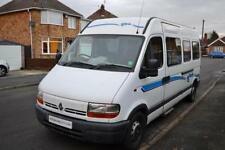 for sale a2003 Citroen Relay camper van diesel, it is a 2 berth. Since then we have done most of the work to it inside our selfs with the help of a few handy friends and a professional camper sparky for wiring up. There is a dent in the side of the van which was in it when i got it. 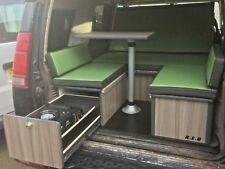 2014 Citroen Relay 30 L1H1Enterprise HDi. £12,750.00 o.n.o. compact only 5m in length(easy to park) with plenty of storage. tow bar with 13 pin socket. roof bars included but not fit. thermal cab blinds and blackout blinds for the rear windows. Citroen Berlingo. Introducing the Getaway camping unit. This space can hold water carriers, tins of food, small cooler or anything else you made need. Renault Kangoo. Peugeot Partner. Fiat Doblo. 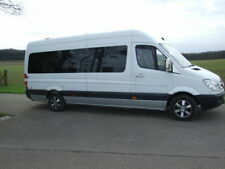 This Campervan has been fully converted to a very high standard with a huge spec. Under floor LPG tank to run all the appliances. (fill up at a service station). We also had a special mattress for the front of the van making one child bed in the front cab (however this is not included in the sale). Berlingo Multispace Desire 1.6 petrol. ULEZ compliant. The Campal conversion unit has been specifically designed to fit safely, securely and neatly into the boot. Excellent condition inside and out, only one previous owner. Advertised elsewhere so may remove. Citroen relay hdi 2.2 camper van 2003. tv aerial fitted on top of van to the distabution board in van. hand wash sink, rear of van has two seats turn into double bed, it's wardrobe. EDM GARAGE SERVICES - Come and visit us for a Tea or Coffee and a chat or for a test drive. - Call us on 441332321314 or click here to find out more. Saxon Motors Dorset Limited - Visit us for a test drive - Call us on 441202007729 or click here to find out more. Greenfield Motors Ltd - We will be more than happy to help you find your ideal vehicle. Give us a call to book an appt! - Call us on 441785338467 or click here to find out more. It is in very sound condition. It a basic camper with little to go wrong. If you see it you will want it! - Recent work - ABS fixed. - TV with dvd player. 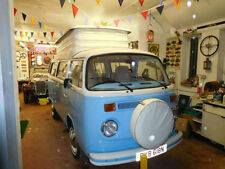 - loads of storage - sideboard, under bed and roof shelves. 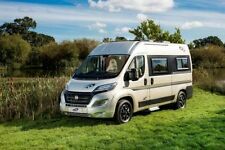 Nu Venture Nu Rio, 2 berth, end kitchen motorhome for sale. 2009/09 Citroen Berlingo Romahome HyLo Limited Edition Bon Voyage 2 85,000 Miles, 2 berth, Fridge, Hob & Grill, Mains Hook-up, Elevating Roof, 1.6 Hdi, Power steering, Electric Windows, Cd Player, Full Service History.